If you’re lucky enough to not only find Miss Rosa's Booth, but to find it open—which is sometimes for just an hour or two in the afternoons (or “whenever Rosa feels like it”)—this is St. Croix’s go-to spot for pates. The crisp pockets of fried dough stuffed with well-seasoned beef, onion and pepper-laced saltfish, or tender conch are a Crucian delicacy. Run, don’t walk. Could this be one of the most beautiful, most pristine beaches on an island of beautiful, pristine beaches? Possibly. It’s certainly the most exclusive. This two-mile stretch of white sand, a National Wildlife Refuge, is closed (and closely patrolled by park rangers) from April to August. During the rest of the year, Sandy Point is open to visitors. But only on weekends. Unless, of course, you’re a leatherback—the critically endangered, and enormous, species of sea turtle that nests here. 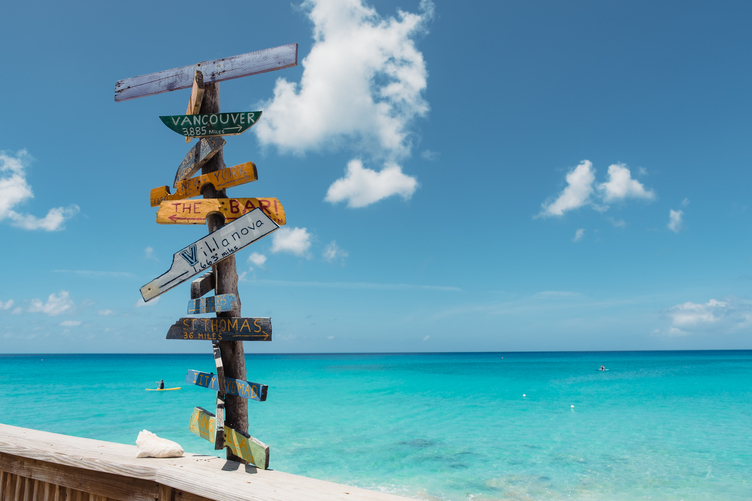 For a beach that’s more accessible (to humans) year-round, Crucian will point you to Rainbow Beach, a local favorite for beach lounging or any seabound activity you can imagine. If it’s hard to imagine an open-air chicken shack so good that it draws dignitaries, you’ve never experienced St. Croix’s beloved rotisserie, La Reine Chicken Shack. Here, row after row of glistening birds spin on long, rotating skewers over flaming, smoking coals. On a weekend, find the place packed with locals playing dominoes, listening to live music, and eating from lunch plates piled with heaping portions of Crucian comfort food. The shack has a full menu—and a full-bar—but the must-have order is a half-chicken, which comes with a side of Johnny cakes and seasoned rice and red beans and costs less than $10 on weekdays. To understand the Virgin Islands, Crucians will send you to the Estate Whim Plantation House Museum, where you’ll find centuries of local history, antiquities, old photos, and art from the many nationalities who have called St. Croix home. Live bands playing ancient African songs and bush tea is served. Take a tour of the old sugar mill, which fed the island’s need for sugar to make its favorite, and most important, product: rum. You’ve heard of food trucks. How about a food boat? In a St. Thomas twist on the mobile food vending concept, this 37-foot, aluminum-hulled sailboat serves New York-style pizza with quirky, only-in-the-USVI toppings from its anchorage in Christmas Bay. A mom and pop operation (in this case, an MIT grad and a professional yacht chef), PiZZA Pi is a floating pizzeria that serves passing boats and makes deliveries by dinghy. Try the Rasta Mon (red curry coconut sauce, flaked coconut, snap peas, red bell peppers, and fresh mango) with added lobster and wash it down with an ice cream rum float. For the ultimate beach bar crawl, take a ferry from St. Thomas to Cruz Bay in St. John, where the beach is lined with waterfront bars and restaurants serving seafood and rum drinks with a side of live Calypso. From here, you can catch one of the dollar taxis—the local transport of choice are a pickup truck with the back cut off and seats added—to go anywhere on the island. Or, you can throw on your island best (or at least a shirt and shoes) and head for this atmospheric "Pacific Rim and tropical cuisines” restaurant Rhumb Lines that locals say is one of the best on St. John. Pass through a nondescript minimart and find yourself in a lush open-air dining area planted with palms and draped in lights. Pull up a stool at the bar, beneath a bamboo roof, and order a specialty drink like a Spiced Caribbean Old Fashioned, a St. John innovation on the classic cocktail, with Spiced Chai Rum, muddled orange, cherry, and St. John Brewers Ginger Beer. And don’t forget the seafood!